The artist wanted to create a visually appealing brightly colored ox which would look good against any background (grass, trees, urban setting), while making it fun for adults and children alike to interact with it. The ox is designed to look good from far away, while providing details for close up examination. When creating the design the artist was greatly influenced by the simplicity in Bauhaus minimalist design, the colors of Mondrian, the fun use of common symbols in the art of Takashi Murakami. 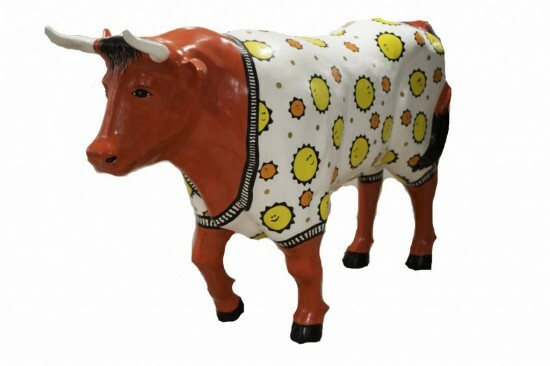 The colored designs on the body of the ox are meant to reference several things at the same time: Sunflowers, Sun, Smiley faces, Gears of agricultural equipment. The groups of flower faces will appear to have conversations with each other, which would be fun to explore close up. Materials: Outdoor enamel paints in bright orange, red, yellow and black; manually cut rounds of metal; Outdoor caulk with strong adhesive properties to attach the rounds.